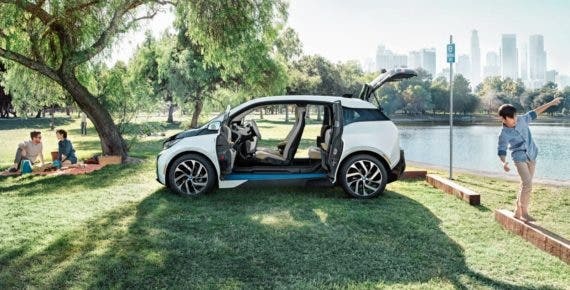 BMW cars with a plug, electric motor, and battery are now approximately 1 out of every 16 BMW USA passenger car sales (6.4% of such sales), based on November’s sales split. That includes sales from 3 fully electric and plug-in hybrid BMW models: the BMW i3, BMW i8, and BMW 330e. The BMW X5 xDrive 40e was not included in this calculation since it falls under BMW’s “light trucks” category — it accounts for 4.3% of that category’s sales. Overall, that means plug-in cars accounted for 5.55% of all BMW brand sales in the US in November. BMW, Nissan, and GM are often identified as the Big Auto companies most focused on advancing electric cars in the US. However, it turns out that Ford is the only automaker with an electric car split of ~6% in November (5.91%). That is, unless you count Smart separate from Daimler and include it as a major automaker. Overall, electric car sales accounted for approximately 1.1% of all light-duty passenger vehicle sales in the US in November, but that hides certain key points. One point is that there aren’t even electric vehicle models available in all car classes, and the models available in other car classes are compliance cars. There isn’t a single car class that has a wide variety of models available nationwide. Another point is that some companies have been much more serious than other companies in their effort to produce and sell plug-in cars. I think BMW, Nissan, Chevrolet, and Ford are the only companies offering their cars nationwide, but that doesn’t mean they are working hard to sell them. Also, although Ford plug-in models are theoretically available everywhere, a friend of the family couldn’t get into one in Southwest Florida — the story the dealer told her and my mom was that they were all going to California. BMW has been leading the industry (among conventional “Big Auto” companies), as I think the percentage split of total sales helps to show. It’ll be interesting to see what happens with the arrival of the Chevy Bolt, Tesla Model 3, an updated BMW i3, etc.